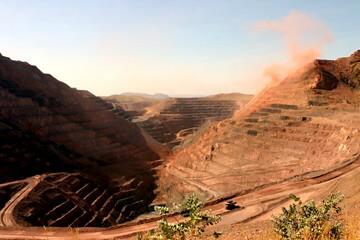 Anglo American and Cliffs Natural Resources sell their 70% and 30% stakes in the Northern Brazilian Amapa iron ore mine to private miner Zamin Ferrous for approx. $400m. A year after buying their 70% share 4 years ago, Anglo took a $1.5bn writedown on the asset. Bumi Resources, partly owned by Bumi plc and part of the dispute between the Bakri family and Nath Rotschild about the future of Bumi, posted a loss over the first 9 months of 2012 driven by low coal prices and a loss of over $400m on derivatives. The loss on derivatives value was driven by a re-calculation of early payment rights, changing the discount rate of the value of that option from 5.25% to 17.2%. Cash-hungry steel maker and miner ArcelorMittal decided to sell a 15% stake of its Labrador Trough iron ore project in Canada to Chinese steel maker Posco and Taiwanese steel maker China Steel, also signing long-term offtake agreements. The large miners are actively divesting non-core assets, trying to focus management attention and funding on the large operations and development projects. Many companies are having trouble securing the funds required to execute the enormous development projects that are currently in execution phase in the iron ore industry. Forming partnerships and selling minority stakes is often the cheapest way to obtain funding. The loss reported by Bumi Resouces is not a sign of mismanagement, but rather a sign of cleaning up the books and trying to make sure the assets listed are actually worth what they are listed for. Valuation of options is a highly subjective art, and the management of Bumi Resources apparently chose to take the revaluation hit at a moment when low coal prices were forces the results into the red anyway. “Zamin, a Brazilian iron ore company, is considering a London flotation. Zamin expects its principal mine in Bahia state – called Bahia Mineracao, or Bamin – to cost $1.8bn to build. The project is half-owned by Eurasian Natural Resources Corp, the London-listed Kazakh miner. Zamin needs to raise equity in order to develop its Bamin deposit, a 41% 2.4bln ton deposit which is located close to the areas most important railroad. Apart from the flagship Bamin deposit, Zamin owns the rights to deposits in Urandi (Brasil) and Valentines (Uruguay). Iron ore price volatility will cause potential of cash amounts raised in the IPO to be rather low. However, no other resources companies will be interested in buying a stake as they will not be able to gain control as long as ENRC holds 50% of the project. Zamin will try to benefit from the higher iron ore price caused by the new pricing mechanism and will try to leverage the expertise of its management team in managing iron ore projects in Brasil in gaining investor’s trust.